Woolensails: Pebble Art for Nick! Saturday we had a beautiful day to get out and comb the beach. 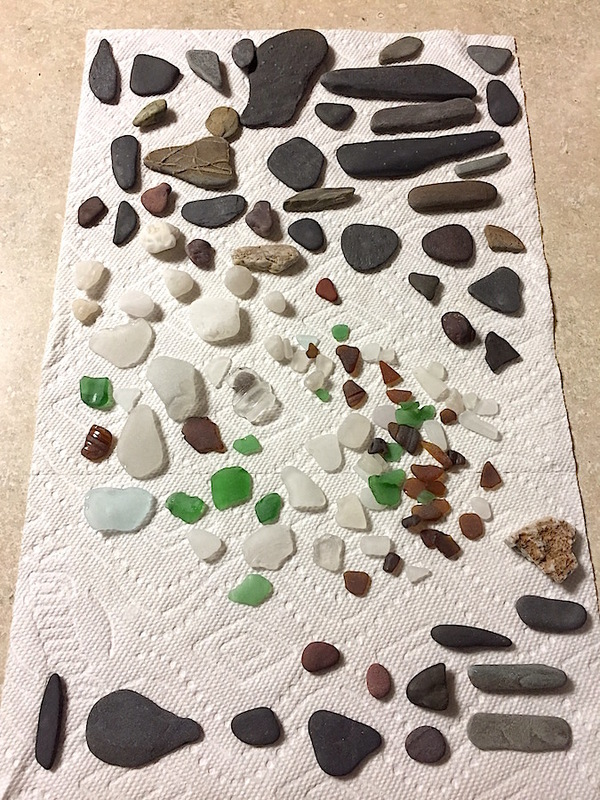 The tide was out, so I was able to get a lot more glass and rocks for my collection. The bad thing was, the tide was coming back in, so I had to run out and grab before a wave came in and hit me. Another bad thing was, Bill went one way with Bean but wasn't paying attention and Bean came back to me for play. Try bending over to grab rocks and glass, while holding onto a dog collar, every time someone came too close, not fun and it didn't help that Bill had the leash with him. I did luck out though and found some nice big chunks of sea glass, as well as smaller pieces to use in art. I tried some shapes with what I had found, just some ideas to see what you can do with them. Sunday was a rainy day, so a good day to stock up on supplies with coupons. 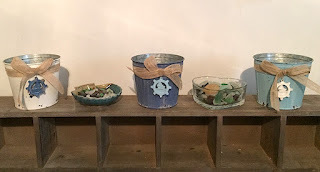 I found these rustic pails to use for storing my rocks, that way I can have small, medium and larger ones, separated. Bill made me a base for my cubbies, but, I saw it and it is huge and too wide. After a while, he says, oh, I closed the wrong end, that's why it is too big, duh. So, he took off the siding and is redoing it, so it fits right. I also bought a bag of black stones. I thought they might be fun to use since they were flat and smooth, but only half of them are, the rest are round and fat. But, I payed a few dollars with a coupon, so worth it to have the good ones. It was a good way to practice and see how it worked. I got some mini canvases, this one is 5" x 3 1/2". I colored in the background, but watercolor pencils didn't work too good and since they are cheap canvases, I couldn't wet it as much, without ruining it. I think I like the plain white ones better, at least until I can make better backgrounds. I used tacky glue which was also a pain, especially with small pebbles, but it holds nicely. I penned in the seagulls and added jute for an edge. I decided this is Nick's piece; it represents all of us at the beach. 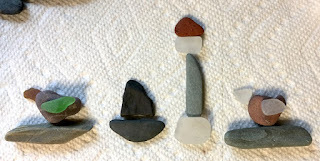 It was fun to try and get some practice with store stones, before I use my good ones. This one is a bit too much in a small space, I do like the simpler ones and will save more detail for larger canvas. I need to find a tiny pebble for Bean's nose. This is something fun you can do or an activity with the kids. Most craft stores carry the smooth pebbles and I found that AC Moore had the best type and lowest price. You can also find smooth stones by the river beds, the tumbling motion will smooth them as nicely as the ocean. Love the colors of your art piece and that Bean is in it too! The sea glass is so pretty! Love this!! 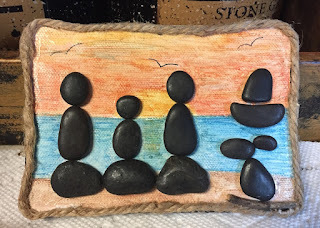 I gather stones to use in art too...wish I had some sea glass!! Have fun! That is so sweet and a nice memory for Nick. We had snow and freezing rain so we were home on Sunday. You come up with so many fun things to do with rocks. What a lovely creative mind you have Debboe. I recall during the Olympics here in Vancouver in 2010 walking near the Science Centre there was a guy bulding Inukshuks along the rocky shore of all different sizes. Check out my post on February 21, 2010 to see them. Maybe you could do some in pebbles. Lucky you to have a beach to find treasures! I love what you have done with the rocks you have collected! Very cute! How novel! Looks like fun. 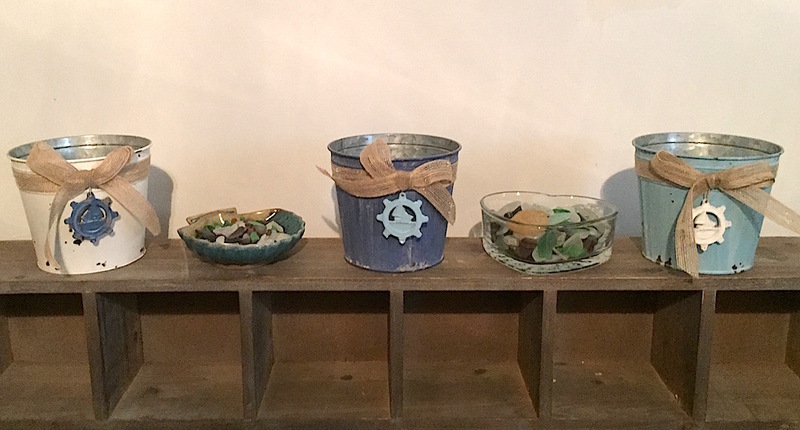 Fun projects with stone and glass! You found a lot of treasures!! I really love that piece with all of you in it, and even Bean - that's priceless, Debbie!! I think you're the most creative person I know!